Viewers explore Thomas Jeffersons less widely known talents and interests as they learn about the music of the Colonial period, played and collected by our third president. This program introduces students to the folk and classical music played in Colonial and Early American times. Lively discussion features Bill Barker, noted Jefferson interpreter from Colonial Williamsburg, and Luis Haza, conductor of the Virginia Chamber Orchestra. They also respond to questions posed in real time from students in the United States and Mexico. Students from a magnet school for the arts and sciences demonstrate how they use computers to learn about music. Originally targeted to public school students, this program was subsequently requested for broadcast to all community colleges nationwide, via an uplink at George Mason University's Capitol Connection. The Claude Moore Charitable Foundation bestowed a special grant in 2010 enabling a free streaming video of the Jefferson program around the clock for eleven months. Produced by the Fairfax Network. Wonders of Geography: A Musical Atlas of America was originally produced in collaboration with the Fairfax Network. The program takes viewers on an innovative musical journey into five major regions of the United States. The Virginia Chamber Orchestra, supplemented by additional instruments, performs selections that transport students to sites including Mount St. Helens, the Grand Canyon, the Mississippi River, and the Appalachian Mountains. Studio guests discuss the physical and cultural features of each region and how those sights and sounds inspired American composers. Live in the studio, students demonstrate percussion instruments used in the musical examples. Joseph McLellan, the late chief music critic at The Washington Post, called this a marvelous enhancement of two subjects by having them interact. Produced by the Fairfax Network. In response to a request communicated by the Fairfax Network for a program focusing entirely on music appreciation, this program was designed especially for the youngest public school students. Their older peers, who introduce students to Mozart, Haydn, and Bach, provide all narration. They learn about accents, major and minor scales, and how composer Joseph Haydn would surprise his audiences! Students and budding musicians develop an appreciation for classical music as the Virginia Chamber Orchestra performs excerpts from major works by the composers. The program is structured so that it can be used in segments as well as in its entirety. Spoken material, musical examples, and award-winning graphics illustrate basic musical concepts. Produced by the Fairfax Network. Students discover the music of Pre-Revolutionary America that reflects the Colonists growing revolt against the tyranny of England as well as the traditional songs of African slaves. They hear music written about George Washington and learn the music that George Washington would have heard on the battlefields and in the ballroom. Student hosts travel to such 18th century sites as Gadsbys Tavern for an 18th century ball and a conversation with General Washington; Pohick Church to hear 18th century hymns sung by the West Potomac High School Colonial Singers; and Mount Vernon where the United States Army Old Guard introduces them to music as a form of communication on the battlefields of the American Revolution. The Virginia Chamber Orchestra performs concert music popular in Washington's time. Historians David Hildebrand and Larry Earl introduce students to a new understanding of 18th century America revealed through music. Produced by the Fairfax Network. 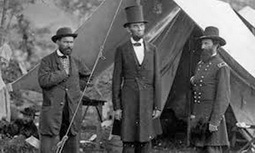 Music in the Life of President Lincoln illustrates what Lincolns musical preferences and experiences reveal about him as a man and a leader, and about his vision for music as a way to reunite the country after the Civil War. Opera excerpts, folk music, patriotic melodies and spirituals are performed by the Virginia Chamber Orchestra led by Music Director David Grandis. The all-professional orchestra is joined by soprano Meghan McCall, the Alexandria Choral Society, and the Grand Contraband Jubilee Singers.